In just over two weeks, I will be stepping away from a career that has come to define my life- ten years, my identity, hours and hours of work just… gone. On a personal level, I’m tired of the commute. I’m lucky enough to get a lift, so I’m not at the mercy of the railways, but it’s still exhausting. I’m tired of having to work when I get home; it’s not cool to be sat on the sofa when your 4 year old gets home and his face drops because you’re marking again and probably will be when he goes to bed. I’m often exhausted (and/or working) on the two days I week I have at home with him. Teaching is a job that never stops. For example, today I’m finding it very hard to not check my email. We are always contactable in a way that I never experienced early in my career. I have to mentally shut myself off from this if I am to get any work/life balance, otherwise I could drive myself mad- and I have done. I am pretty sure that most of the anxiety attacks I have experienced in the last few years have been as a direct result of work. I’m a good, conscientious worker; I hate letting down my colleagues and, most importantly, my students. I also want to be around to take D to school- leaving at 6.50am everyday isn’t the best thing for this. So I’m going. I resigned in January (on the day of Trump’s inauguration, as it happens.) I’d had a tearful discussion with one of my bosses about it, (although I’d decided the previous May with Benn, in a Pizza Express on our anniversary, as he had picked up that I wasn’t happy and hadn’t been for a while. He asked me what I needed and said that he would support it.) I knew that I needed at least a break, if not something more permanent, otherwise I would be at risk of becoming one of those horrid, bitter and jaded teachers we all remember having. I genuinely adore most of my students and I didn’t want to inflict that on them. I mean, I’m a tired teacher, but I’m not a horrible one. I also knew that moving to a different school wasn’t an option. I just need to be out of a classroom. People find it really hard when I tell them I have no plans. I mean, I’m not going to live off Benn (I managed to save a bit- so if you’ve invited me out recently and I’ve said I’m skint, you now know why…), but I am going to take some time to find something new. I have no idea what, yet, but I’m sure something will come up. And yes, I won’t have the holidays, but I will have my evenings and weekends back- 90% of parents cope with holidays, I’m sure we will too. It also means that if Benn’s office does finally get its long threatened move to Croydon, I’ll be around for D. We’ll just be reversing our roles a bit and I’m OK with that. I probably won’t have the same sort of wage, either, but you cut your coat according to your cloth and I’ve coped before- I’ll cope again. Right now, I’m looking forward to reading, writing, listening to music, all without a deadline. But if you do see any jobs in Brighton, give me a shout, yeah? I had an epiphany today and it all started when I went to have my passport photo taken and I forgot to take some makeup with me. I had applied it before I left, but a biting wind and cold weather meant that my eyes watered really badly (which happens ALL THE TIME. So much fun.) All my concealer disappeared in a puff of smoke. On the plus side, at least I can see what my mugshot will look like when I’m arrested for murder in twenty years’ time= tired with massive under eye shadows. Delightful. I’ve been wearing makeup fairly regularly since I was sixteen. Back then, it pretty much consisted of liquid eyeliner and mascara, with the odd bit of Rimmel Hide the Blemish when I needed it. My mum didn’t wear makeup and I was never really interested in it before I started college and going out. My basic makeup has evolved from this starting point, but boy has it got complex: I counted that, on a morning, I can use anything up to FOURTEEN different products on my face- and that’s only if I use one shade of eyeshadow (I sometimes use up to three.) That’s skincare and makeup, by the way: serum, moisturiser, primer, foundation, powder, eyeshadow, mascara, eyeliner, eyebrow gel, blusher, highlighter, lip balm, lipstick. Some mornings I even put a bit of oil on my face before a serum even touches it. This has been a gradual build up of stuff over the years that has only recently got to this size. I’ve always loved playing with makeup and its ability to transform me at 5.30am from looking like a very tired builder called Graham to, well, a better version of me. But who’s to say that is a better version of me? And do I just look tired because I’m an insomniac who, at least three times a week, gets up at 5.30? Could I actually live without less makeup? Could I maybe get a bit more sleep if I didn’t wear as much makeup? And who exactly am I doing this for? I got seriously into makeup around the time D was born; I think I was trying to re-establish my identity and not just be ‘mum’. My makeup was also armour at a time when, emotionally, I felt weird. I had the deadness of post-natal depression battling with the hormonal weirdness of new motherhood. Makeup helped me put a brave face on a difficult time and helped me to distinguish between home and the outside world. So I think I’m adopting this for work. Skincare stuff, a good SPF- let me know if you recommend one, btw-plus very basic makeup and that’s it. Will it be weird? Probably. But in the long-term I think it will really pay off. And of course, I reserve the right to wear more makeup on days when I want to, I just don’t want feel like I have to. The Happiness Project #3: Who inspires you today? I admire so many people, but they inspire me on different days. This is kind of like having a wardrobe of inspirational people in my mind- depending on the type of day it is, I channel a different person. Do I need to be fearless? 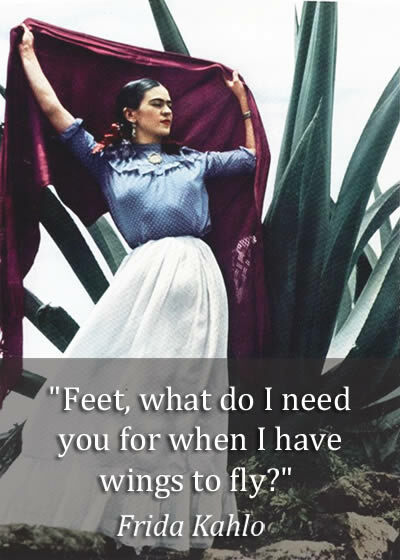 I might be channelling Frida Kahlo today. Do I want to be bold? Maybe I’ll dig out my inner Josephine Baker. Witty? Oscar Wilde, every time. I find that colour can have a massive effect on my mood and how I feel in general- it’s a small thing, but it can have a huge impact. It can be a nail polish or lipstick, a scarf or the glasses I wear that day. Colour can be a shield or a beacon and I use it accordingly. So today I’m going to wear one colour that is cheerful- and I’m going to compliment someone on something colourful they’re wearing.